Let’s get this straight out of the way. Joanna Newsom is probably the most divisive artist of the 21st Century; she provokes a stronger reaction than Obama’s Healthcare bill with a side order of Marmite on toast. On the surface, it’s easy to see why she would rub people up the wrong way - a baroque harp-playing prodigy singing modern-day madrigals in a voice which is equal parts Kate Bush, Joni Mitchell and a melismatic pixie princess on helium. However, if you can’t see past any of this, then more fool you, as you’re missing out on something astonishing, especially where Have One On Me is concerned. Just in case you weren’t aware of this yet, Have One on Me is a touch longer than your average record; in fact, it’s over two hours long and comes packaged as three CDs, each containing six tracks. Assimilating such a large amount of music may seem arduous and it’s true, how often do you get two hours to do nothing but listen to a record? Yet as well as this album being entirely engrossing on a standalone play, it’s also rich and imaginative enough to reward casual listening, where you can perform a lucky dip anywhere amongst the eighteen songs and be rewarded. 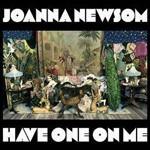 Have One On Me opens with Newsom gently forming a single word, “easy”, which sounds almost comically arch considering the complexity and technical skill of the songs that follow. Straight away it’s clear that she takes great care in her vocals and considers her voice to be as important an instrument as any other. As previously mentioned, the singing of La Newsom can be an acquired taste for some, but you’d be hard pressed to find another artist in 2010 who can express so much through just their vocal cords. The restraint of Easy, the rousing chorus of Good Intentions Paving Company, the animalistic yelp towards the climax of In California, the shimmering and arresting Ribbon Bows - the variety is both admirable and completely beguiling. When Newsom coos “in your arms” with such warmth and longing on No Provenance, it feels as if she’s singing directly to you, causing an involuntary shiver. If you’re not entirely ensconced in the world of Newsom at that point, you might want to be calling the emergency services and checking your pulse. Even more extraordinary than the utterly mesmerising vocals is the astonishing attention to detail that has gone into the playing and recording of this album. It sounds ridiculous to suggest that not a note is out of place in an LP that tops the two hour mark, but it’s true. Newsom’s harp playing is bewitching, transforming an instrument that is mostly plagued by cartoon celestial connotations into a thing of otherworldly beauty, perfect for the songs it frames. At times, it appears that Have One On Me is the missing link between pop music and classical. We may be talking harp, horns and flutes rather than guitar, bass and keyboards, but the songs retain an irresistible accessibility, with more hooks than a JM Barrie convention. Have One On Me defies convention and categorisation. Joanna Newsom is primarily earmarked as a folk artist, but this album is packed with such myriad styles, it’s impossible to pigeonhole. There’s straight-up singer-songwriter fare on the stylish ‘81, the barely-there instrumentation and perfectly judged light swing drumming of Occident, the Spaghetti Western giving way to bar-room blues of Soft as Chalk and the 1920s glitz and glamour reminiscent of old Hollywood of Autumn. Newsom manages to inhabit these songs and styles with such aplomb and conviction that it’s simply breathtaking. It’s also expertly sequenced, so the pace never drops and you remain enraptured for the duration. After a breathtaking two hours, Have One On Me closes with the fluttering Does Not Suffice - potentially another irony-tinged nod to the sheer breadth of the album. Even at this late stage, there’s invention aplenty and a refreshing refusal to conform to type, with its flourishes that sound somewhat Gaelic and gothic simultaneously. It’s not a remarkable track in the context of the album, yet it is a significant one; a tender lament replete with a heavy sense of nostalgia. It’s as if Newsom recognises what an achievement Have One On Me is, and she’s just as astonished as the rest of us. The album experience is now complete and although it’s been hard work for her (and an all-too-rare feast for us), she’ll actually miss it now it’s gone. It’s unlikely that Joanna Newsom will be able to make an album as broad in scope and texture as Have One On Me again. This is a career-defining piece of work, and she’s completely earned her right to spend the next five years knocking out four-to-the-floor crowd pleasers. It’s not going to happen though, is it? Summarising Have One On Me in a word is an impossibility, but the most apt is probably “absorbing”. If you hold the belief that the best albums inhabit their own space and time, and draw their listener into that world for their duration, then Have One On Me is fit to stand alongside the finest examples of the craft. It’s difficult to predict legacies for new albums without sounding like a misguided merchant of hyperbole, but Have One On Me is so enrapturing, so imaginative and so delicate, that it feels safe to say that in five or ten years time, you’ll go back to it and discover brand new things - whether they be the meaning of a song you’d never fathomed before or a simple amuse-bouche of a beautifully constructed oboe phrase. Enough with the florid prose, please, buy this album. Don’t download it, buy it on a physical CD, hell, buy it on vinyl. Get rid of outside distractions, remove any white noise and give Have One On Me the full attention it deserves as one of the finest albums of this, or any, year.